The club had breakfast, lunch and dinner for us Saturday and Sunday. They put genuine bubbly in the tin cups and kept the keg open well into the evening. The party under the tent was fun, meeting up with friends from around the region telling stories until way too late Saturday night. Saturday’s camping was remarkably cool and comfortable, and consequently I slept like a log. The regatta had 4 Buccs in attendance, and was impressively tight racing. We did sail in our own fleet, (though had to share the line with the Mutineer fleet (3 boats registered, 1 sailed the course) There were 7 races in total, 4 on Saturday, 3 on Sunday. Conditions varied quite a bit due to the northern breezes Saturday and Sunday morning. Saturday the breeze was northerly for the whole day, shifting to the east & getting lighter, making things quite interesting. Sunday afternoon a nice 8-10 knot sea breeze filled in and conditions were absolutely perfect. 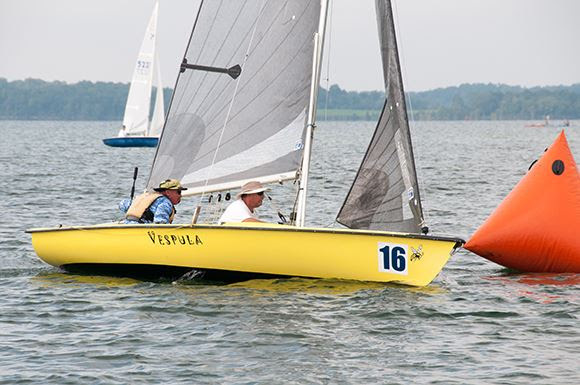 We sailed triangle courses on Saturday and windward leeward on Sunday. 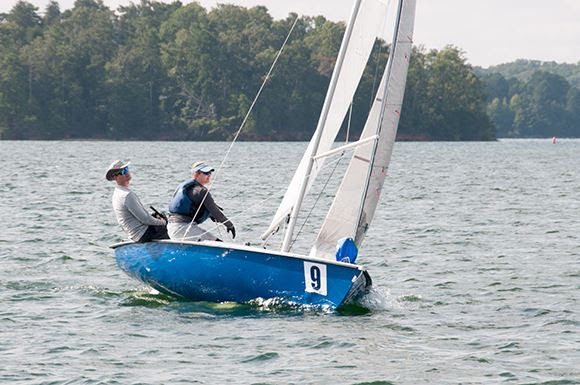 Jeff & Heather won the first race by a few boat lengths, then had an unfortunate capsize on the second race resulting in the loss of their rudder. The subsequent races were very tight. We (Jimmy & Evan on WASABI) won the second and third race, Mike Sigmund (Scarlet Banshee) won the 4th. Sunday race 5 was quite interesting with very light breeze to start, and big shifts. John Chaplinsky (Stale LAce) was leading into the finish, but we nudged them out winning by just a few inches. 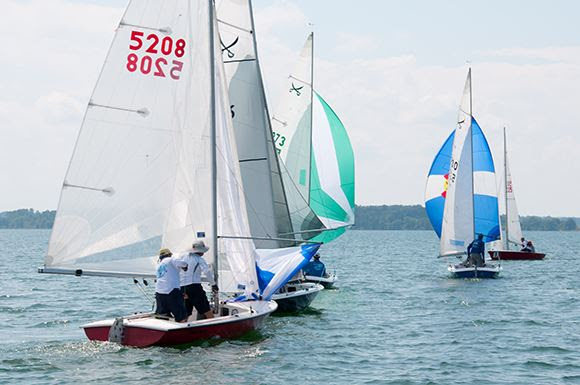 Mike & Tim (Scarlet Banshee) had incredible upwind speed and point in races 6 and 7, taking the final two bullets. The weather was perfect, the racing was excellent, we got to see dolphins & rays swimming alongside us. I’m very glad to have made the trip, and will be back again next year. Buccaneers take the cup 6th year in a row! 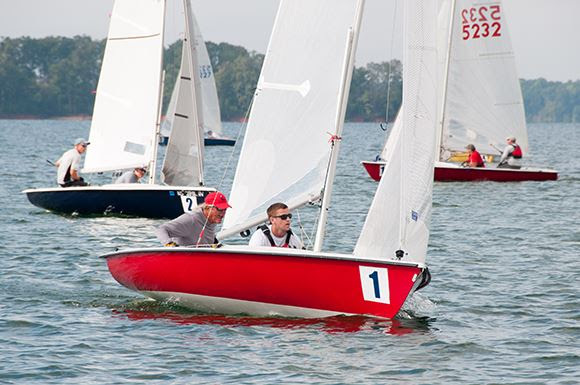 The Buccaneer fleet won the NC Governor’s Cup this weekend for the sixth year in a row! 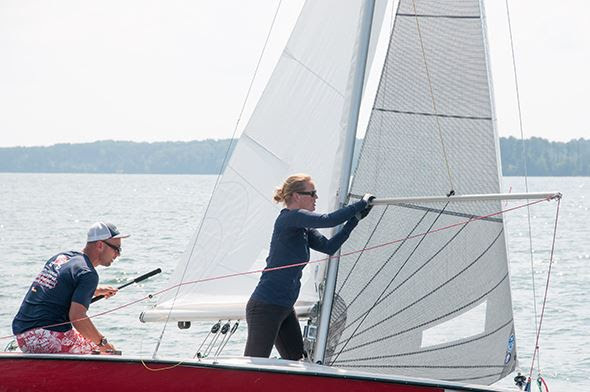 Erik Gyorgy and Jennifer Marbourg-Miller aboard Christopher Dragon sailed an almost perfect regatta taking the Cup. A Buccaneer sailor also won female sailor of the regatta, Kyra Tallon, Aurora’s skipper, made all Buccaneers extremely proud and happy as she was deservingly recognized as an outstanding sailor. But all the news is not good. Shortly after the awards ceremony the Flying Scot fleet held an emergency meeting. My sources tell me that they are hell bent on winning back the Governor’s Cup that the Buccaneers took from them 6 years ago and are preparing drastic actions to win it back. The Flying Scots!!!!!!! We simply cannot allow this to happen. We need your help. 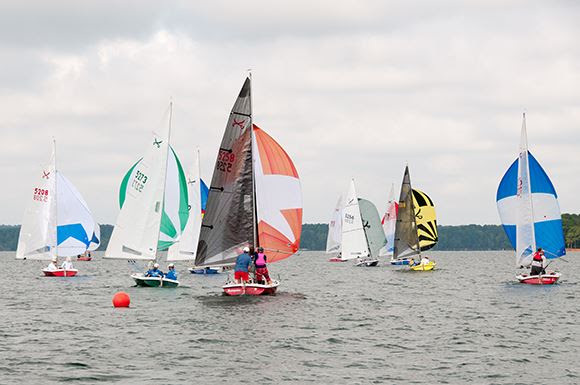 Please mark you sailing calendars now for the 2018 NC Governor’s Cup which will be held June 15, 16 and 17, 2018. We are going to need at least 20 Buccaneers on the line to stave off the assault the Flying Scots are plotting at this very minute! The venue is fantastic, the food is good and plentiful, and the good times roll. 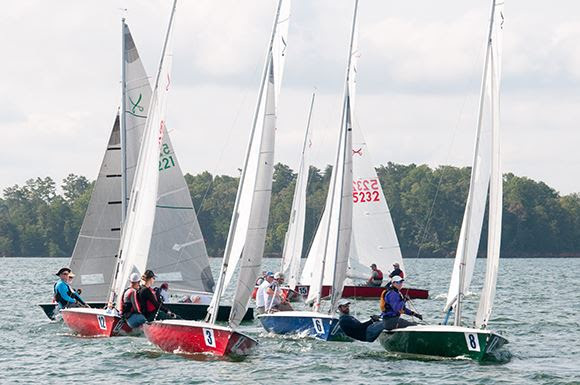 North Carolina Governors Cup, fast approaching! The Carolina sailing club…and the Bucc fleet in particular REALLY knows how to throw a PARTY… ooh, and it’s awesome sailing too. The Buccs have taken the cup for 5? years in a row now…let’s do it again. Buccaneers are simply…………… all around, best fleet on the water. There’s little surprise skippers are “jumping ship” to sail with us! Niantic Bay Yacht Club in Niantic, Connecticut. Here’s information on housing options around Niantic, Connecticut. Connecticut has the distinction of having the highest motel tax of any state in the USA, 15%. Millstone Nuclear Power Station is located across Niantic Bay from NBYC. This plant is undergoing scheduled maintenance during BNAC, which means many motels rooms in the Niantic area are already booked by contractor crews working at the plant. I suggest you make reservations ASAP to ensure a place to stay, even if you are not sure you can make it to BNAC. You can cancel your reservation without any penalty close to the start of BNAC as explained below. The reservation code for these discounted rates is “BUCCANEERS”, but you need to make the reservation by phone to get this discount. These discounts only apply for reservations made before August 27, 2017. There is no penalty for reservations cancelled before 4 pm the day before scheduled check-in. Motel 6, Niantic, Ct. Bare bones room. Two double beds or one queen in each room and not much else aside from a small TV. This motel is closer to Rt 95 and the road noise is moderate. Ask for a room on the side of the building away from the highway. There is no breakfast or any amenities to speak of. WIFI is $3 or $5/night extra, depending on speed. The discounted rates shown below are only $5/night below the regular rates. These rates are for two adults per room. The rates are slightly lower or higher for 1 or 3-4 adults/room. The reservation code for these discounted rates is M106300145 with group name “BUCCANEERS”. You need to phone the Group Sales Department at 1-88-544-4866 to make your reservation. There is no penalty for reservations cancelled before 6 pm the day of scheduled check-in. Rocky Neck State Park is only a couple of miles from the boat club. But, it’s unclear whether it will be open during BNAC. Connecticut is struggling with its budget and it’s likely the state parks will be closed soon after Labor Day. The state budget is supposed to be resolved by May. Check then to see if the park will be open until Sept 30 or not. There are a number of private campgrounds in the area. Do a Google search. Easter Buccy 2017! A very different kind of regatta. It’s that time of year again, Easter Buccy is fast approaching. April 15 in Alexandria, VA look out for little Buccaneer boys & Girls searching for their hidden eggs…. The bunny put them in some pretty strange places …. You’re going to have to sail & find them! Pirates beware…things can get rough around here. This is an event for everyone.